Summary: “Vika Andreyeva can summon the snow and turn ash into gold. Nikolai Karimov can see through walls and conjure bridges out of thin air. As long-buried secrets emerge, threatening the future of the empire, it becomes dangerously clear . 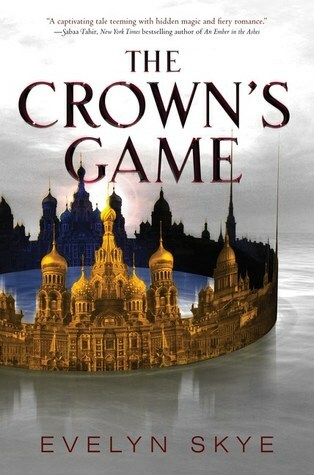 . . the Crown’s Game is not one to lose.” (Summary found on Goodreads). I am so happy I got to meet Evelyn Skye and Yallwest. She is a sweetheart and I fell in love with The Crown’s Game. A little background information here: I’m currently taking AP European History and I have loved nearly every minute of the class. This book is set in Imperial Russia, a period I studied myself, which made it a million times better. The great thing about this book is that it doesn’t scream “historical fiction”. It feels just like a fantasy book, but set to the backdrop of a riveting historical period. The history isn’t overwhelming. In fact, it isn’t even about the history at all. It just happens to be set in this period. Another great part, is that it didn’t seem like most of the other young adult books out there. The writing was more mature and thicker, but never overwhelmingly so. Though, I do have to say, the characters felt a little immature. The romance wasn’t strong and Pasha seemed more of a caricature than a character. However, I can see this definitely improving as the story develops over the next book. (Is this a duology? I’m not sure). I still loved Pasha, don’t get me wrong, I just felt like he was written to be someone much younger than he is. The romance seemed a little like insta-love too, which is a bit of a pet peeve of mine. I’m team Nikolai, by the way. Because so far, I haven’t met a fictional Nikolai I don’t like. What I liked about Vika is that she didn’t need a boy to define her personality or beauty or talents. She was strong, with or without a man at her side. Thank you, Skye, for telling us that a girl doesn’t need to be told she’s beautiful to be powerful. Vika is strong–she’s a warrior, but not the typical kind. I can see myself growing to like her through The Crown’s Fate. At this point, I can’t say I loved her, mostly because I didn’t feel like I knew her.